To continue on our journey of spring trends (we have already covered some makeup trends, neon lips and matte lips) we are going to travel on over to fashion. I am so excited to see once of my favorite trends coming back into style...the WIDE LEG and the BELL BOTTOM. Hurrah! On top of me absolutely loving everything about the 70's these jeans are INFINITELY more figure flattering than the ubiquitous skinny jean. 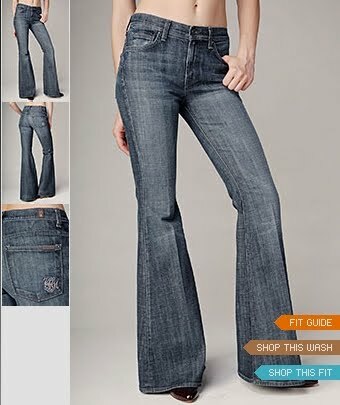 If you are not a stick figure with tiny pin legs I can guarantee this trend is something that will be 100 times more flattering that the skinny jean. I know personally, for myself, this style elongates and thins out my legs just as well as some liposuction (wink wink). One especially stylish person that automatically comes to mind when i think of a wide leg bell is the stylist du jour, Rachel Zoe. 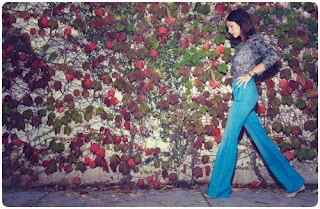 She has been rockin' these pants for a few years now. Girlfriend know how to look skinny and work with your body. I have almost never seen her in a pair of skinnies! What are some of my faves for the season? AG is one of my personal favorite brand of jeans. The farrah is calling my name here. I also am loving the bell flare below. The AG store is one of my fave's in New York in Soho on Greene St. I def recommend checking them out! J brand is always a good one, check them out here. You can pick these up basically anywhere, bloomingdales, intermix or their own website. Check out this new brand Mother here. Last, but not least 7 for all Mankind. Sign me up for a pair of vintage washed bells and a tan pair of wedges. Will you be embracing this trend? I've always loved wide leg! Infact i wore a 70's style wide leg jumpsuit around xmas. Beautiful! I posted on my blog..
Heck yes! I already have numerous pairs on my wish list! I was reading an article about this!! SOOOO excited!! I swear I was born in the wrong era because while I was reading the article (and this blog) I was jumping up and down like a little kid. Spring cannot come fast enough! GO. AWAY. FLARES. BooOOOOoo! :P Wedges, you can stay. Bootcuts, you're ok too. Love!!!!!!!!! I want to get J Brand Love Story jean!!! Still haven't gotten them!! I hate flares because all pants are too long for me. I need like a 26 in inseam and they don't make pants that short for people who have a 28 in waist. At least with skinnies I can tuck them into my boots and trick people into thinking they fit. With flares there is nowhere to hide. I do like wedges, but they are so hard to walk in! I prefer my motorcyle and cowboy boots. Love the long flare look. Makes the legs look slimmer.